The Pacific War Encyclopedia: Wingate, Orde C.
Orde Wingate was born in India to parents who were members of the Plymouth Brethren, a conservative Christian Evangelical sect. Wingate was home schooled until his teen years, and when he finally became a day student at a private school, he was so profoundly unsocialized and lax in his personal hygiene that his fellow students dubbed him "Stinker." His father was also a retired Indian Army colonel, and Wingate entered the British Army after the First World War, being commissioned a second lieutenant in the artillery in 1923. Though by then he had left the Brethren, he retained a deep religious outlook to which he added a genius for creating antagonism against himself. Though athletic, he was not interested in team sports, which was quite unusual in the British Army officer corps of the day. Becoming fluent in Arabic, he served with the Sudan Defense Force in 1928, then returned home to be married and attend Staff College. Unexpectedly rejected for admission to Staff College, he confronted the Chief of the Imperial General Staff and made such an impression that he was promised the next staff assignment. Everybody's against the Jews, so I'm for them. During one of the "night squad" actions, Wingate was wounded five times by friendly fire but continued calmly giving orders. Among those who served under Wingate were future Israeli generals Moshe Dayan and Yigael Yadin. Chaim Weizmann, who knew both Wingate and T.E. Lawrence ("Lawrence of Arabia") though the two men were much alike. However, Wingate's commitment to Zionism was considered an embarrassment and led to his relief and recall to Britain to serve in an antiaircraft unit. During the early stages of the European war, Wingate served in East Africa with Gideon Force, a guerrilla formation of about 3000 men, which proved enormously successful against the 36,000 hapless Italians it fought against. He was again relieved and demoted to major for failing to allow British regulars to enter Addis Ababa first and thereby increase British leverage over Haile Selassie, the Ethiopian emperor. Back in Cairo in July 1941, half-delirious with malaria, he attempted to cut his own throat but was saved by a fellow officer. 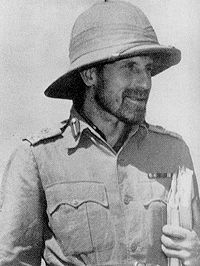 Wavell was sufficiently impressed with Wingate's guerrilla operations to call him to the Far East in May 1942, where Michael Calvert had already led small guerrilla raids into Japanese-occupied Burma. Calvert would become one of Wingate's most trusted lieutenants. Wingate developed a doctrine of raids by columns supported from the air, and persuaded the theater commanders to allow him to make deep-penetration raids with his "Chindit" forces hundreds of miles behind Japanese lines. These raids caused considerable disruption to Japanese logistics, but at an enormous cost to the raiding columns. The Japanese were not as hapless as the Italians and the raids must be judged a military failure. However, they boosted morale and captured the imagination of enough Allied leaders, including Churchill, that Wingate continued to receive support and encouragement. However, he died in an aircraft accident on 24 March 1944, early in the second Chindit expedition, and his forces were eventually returned to more conventional duty. a broad-shouldered, uncouth, almost simian officer who used to drift gloomily into the office for two or three days at a time, audibly dream dreams, and drift out again ... as we became aware that he took no notice of us ... but that without our patronage he had the ear of the highest, we paid more attention to this schemes. Soon we had fallen under the spell of his almost hypnotic talk; and by and by we — some of us — had lost the power of distinguishing between the feasible and the fantastic. I think he really was a genius ... a superman, because he was able to invent, persuade, plan, train, and execute. He was throughly hated by almost everybody.... He had no instincts of kindness or charity at all.... He loved publicity, although chiefly because it furthered his ideas. In conversation he was almost hypnotic. I have heard him lecture for 4 hours and more without a break and hold everybody's attention. His physical courage sometimes failed him but his moral courage never.... [W]hen all is said and done, he was one of the best soldiers and certainly one of the greatest men I have met. In a word, he was mad. In spite of his eccentricities, or perhaps because of them, Wingate was able to instill strong devotion in some of his followers. For example, after he broke an engagement to marry the much younger Lorner Patersonin 1935, his former fiancée never married, claiming no man could ever match Wingate. While some of his officer, such as Fergusson, eventually became disenchanted, Calvert defended Wingate's military tactics to the end of his life. However, it is not at all clear that Wingate was the same kind of military genius as Jackson. Jackson's Shenandoah Campaign during the American Civil War was the perfect diversionary operation: It completely misdirected the Union generals at little cost to the diversionary force. By contrast, Wingate's Chindit raids merely inconvenienced the Japanese at enormous cost to the raiding columns. Wingate was particularly talented at antagonizing staff officers, and the claim that his operations inspired Slim's air logistics during the retaking of Burma is exaggerated. In my opinion Wingate was deliberately untruthful in some of his statements, and most disloyal in the method he frequently pursued of passing such statements behind the backs of some commanders to others. Churchill, by contrast, remained enthusiastic about Wingate, calling him "a man of destiny" in his memoirs. Perhaps Churchill saw a little of himself in Wingate. Both men were Zionists; both by temperament were military adventurers; and both were subject to severe bouts of depression. However, Churchill understood the importance of administration, while Wingate had neither the patience nor the training for staff work and lacked the empathy necessary to get inside the mind of the enemy. Wingate also had a tendency to constantly change his plans, violating the military principle of maintaining the objective. Wingate's flaws apparently did not prevent Churchill from considering having Wingate relieve Slim as commander of 14 Army, but Wingate's untimely death prevented any such plans coming to fruition. Graduates from Woolwich and is commissioned in the artillery.